Click Alsace on the map below for full information on cruising areas. Click on base names for detailed maps and cruising routes for cruiser boats and penichette boats. Alsace on the borders of France and Germany offers magnificent scenery and gourmet restaurants. The famous Arzviller boat lift raises boats 45m in 20 minutes! Read our guides to Boating Holidays in Alsace. 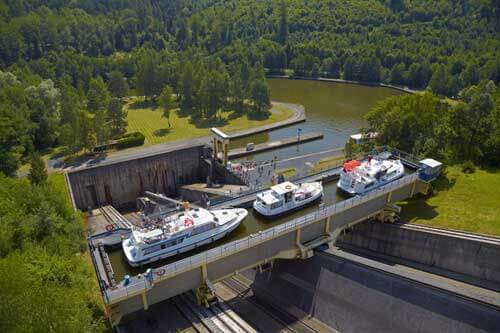 In Alsace we offer three cruiser boat bases and a penichette boat base on a network of rivers and canals to towns such as Strasbourg a World Heritage city, Metz, Nancy and Saarbrucken. A circle route into Germany may require a licence. Our penichette boat base in Ardennes allows one way cruises through the forests, home to wild-boar, deer and rare birds, and along the River Meuse into Belgium.